The selected property is set to true if the checkbox is marked by default when the Dynaform was first loaded. If needing to get the current state of the checkboxes, then use control.getValue(), not the .selected property. The control.getValue() method returns an array of the values of the marked checkboxes in the checkgroup. 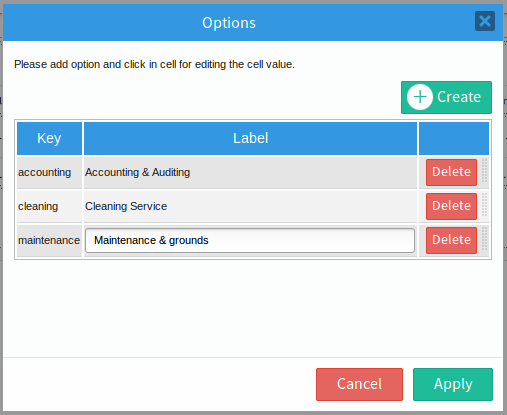 Now the aValues variable contains the array ["accounting", "maintenance"], since the first and third checkboxes in the checkgroup are marked. Likewise, use the control.getText() method to get a JSON string holding an array of the marked checkboxes' labels. JSON.parse() can be used to convert the string into an array of the selected labels. The control.setValue() method can be used to mark checkboxes in a checkgroup. control.setValue() takes an array of the checkbox values to mark in the checkgroup. Note that the values have to be listed in the array in the same order as they appear in the checkgroup. If needing set just one checkbox, but leave the other checkboxes unchanged in the checkgroup, then use $.inArray() to first check whether the checkbox is not already marked. If unmarked, then mark it using Array.push() to add the value of the checkbox to the array. Then, loop through the list of getInfo().options to recreate the array in the proper order and pass that array to setValue(). Similarly, the following code uses setValue() to unmark (unselect) the "accounting" checkbox in the "selectServices" checkgroup if the checkbox is not already unmarked. It uses the Array.splice() method to remove the value from the array of selected values. Each checkbox in the checkgroup is placed inside a <div>, whose class is named "checkbox". In this example, .find() returns an array of the divs holding checkboxes and .eq() is used to select one of them. Note that arrays start counting from the number 0, so the first checkbox is element 0 in the array and the third checkbox is element 2. Note that hiding a checkbox does not prevent its value from being saved when the DynaForm is submitted. To disable a checkbox in a checkgroup, set its disabled property to true and set the color of the <span> holding the checkbox's label to grey. The control.getControl() method will return an array of all the checkboxes in a checkgroup. Use .eq() to access a particular checkbox in that array and remember that counting in arrays starts from 0. For example, the following code sets the label of the second checkbox in the "selectServices" checkgroup. It uses .siblings() to select the <span> element next to the checkbox which holds the checkbox's label. The control.setOnchange() method for checkgroups has its own idiosyncrasies. The newValue in the change event handler function will be an array of the values of the currently selected options. However, the oldValue will be a JSON string holding an array the values of the previously selected options. In order to use that array, it needs to first be decoded with JSON.parse(). This page was last edited on 18 January 2019, at 23:58.